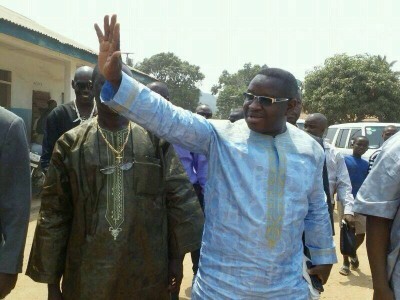 Julius Maada Bio – the 2012 presidential candidate for the Sierra Leone Peoples’ Party (SLPP), returned home yesterday, 11th October, after pursuing his doctoral studies at the Bradford University in the UK. Last month, in the aftermath of the flooding that destroyed thousands of properties in the country, following heavy rainfall, Julius Maada Bio is believed to have donated a large consignment of foods and non-food items to flood victims in the Bo District and Freetown. Is Maada Bio now looking for rapprochement with State House? Today, Maada Bio was accompanied to State House by close political allies in the SLPP – his former 2012 running mate Dr Kadie Sesay, and the deputy chairman of the SLPP – Prince Harding – who has made no secret of his strong opposition to Dr. Yumkella’s membership of the SLPP. State House Communications Unit reports that during his talks with Maada Bio, the president took the opportunity to call on all politicians in the country to focus on ending the Ebola crisis, rather than politics. This is not the time for politics, he said. But political observers say that these veiled warnings to the former military leader are being made by the president in response to fears of a return to political violence, following recent allegations that Bio’s supporters are responsible for the riotous behaviour that took place outside the SLPP head office, during the visit of Dr. Kandeh Yumkella. 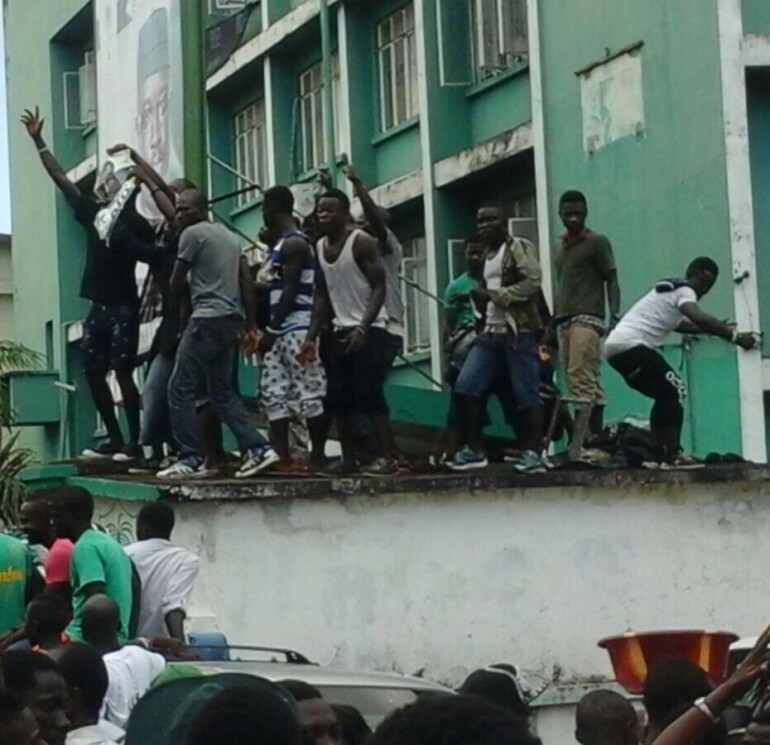 Political tensions have been rising recently in Sierra Leone, especially after the sacking of the vice president, as well as the arrest and detention of opposition members for holding party meetings and rallies, whilst ruling party supporters were free to meet and demonstrate in favour of the government. State House report today says that both the president and Bio discussed the current countdown towards Ebola Free Sierra Leone and the need for national cohesion. President Koroma is said to have called on the former military leader to work with the government to help bring the Ebola crisis to an end by the 7th of November 2015. The president told Bio that his government has led the fight against the Ebola virus with the support of other organisations. It is well documented that Maada Bio has been highly critical of the president’s handling and mismanagement of the Ebola crisis. But president Koroma, who is constantly looking for new political allies to strengthen his future ambitions, told Maada Bio that his door is always open, particularly to those that are interested in working with the government and other players to move the country forward. He encouraged the former SLPP presidential candidate to continue to work collaboratively, says the State House report. Political observers commenting on Maada Bio’s statement today at State House, say that the former military leader has done a complete and hypocritical u-turn, after his recent press statements had strongly condemned the president, whom he now praises for providing effective leadership in the fight against the Ebola virus, and for what he also regards as the government’s proactive stance in helping and catering for the welfare of those affected by the flooding that took place on the 16th September 2015. Bio also said today at State House that although the country is still at risk of Ebola recurring, substantial progress has been made by the government in breaking the chain of transmission and controlling the spread of the virus. 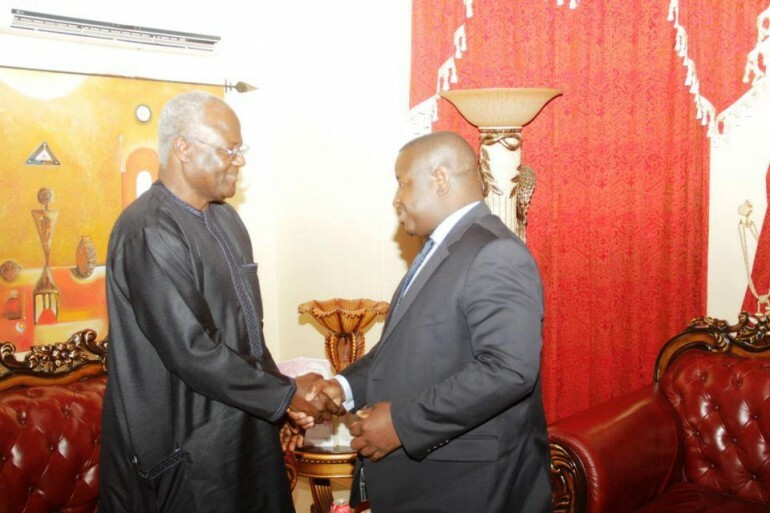 (Photo: Maada Bio meeting Koroma at State House a few years ago). 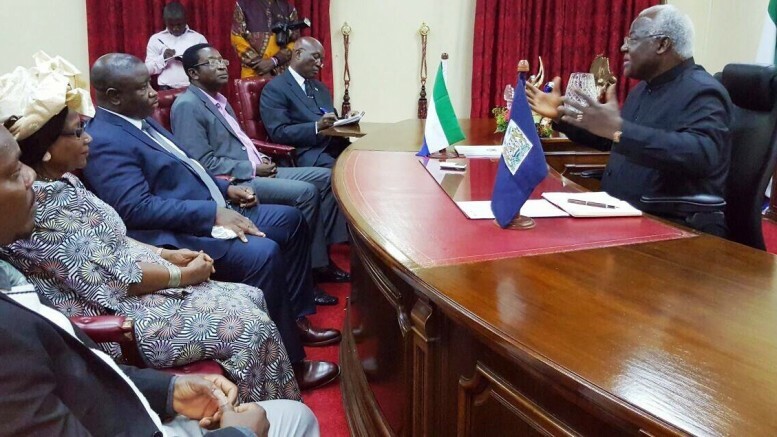 According to the State House report, Maada Bio spoke to president Koroma about his desire to work with the government in promoting its social mobilization and sensitization drive to end the Ebola crisis. And to this end, he said he will be travelling around the country, calling on communities to continue to follow the health restrictions so as to bring the crisis to an end. Today’s meeting at State House raises more questions about the former military leader’s political game plan and modus operandi. Is Bio seeking rapprochement with the ruling APC in advance of the 2018 presidential election, which he is hoping to contest? Maada Bio is the only man that can save this country from any threat again. We should respect him as a man of the true democracy that we are enjoying now. From military rule to a democracy – whoever in West Africa has set such a record? Lol … pursuing his doctoral studies? Seems like another honourary degree is in the offing a la Prezo and Vice. But one based on (academic) merit is best! Unconfirmed reports reaching local media say that the ruling All Peoples Congress (APC) has been very jittery and panicky over the huge popularity of the former United Nations Secretary for energy – Yumkella. Reports state that some senior officials of the APC have held secret meetings at Radisson Blu recently to discuss the potential threats Kandeh Yumkella will pose to them if he makes an entrance into the political arena. All the secret meetings concluded that they would rather prefer Maada Bio to contest against an APC presidential Aspirant, other then any other candidate because Maada Bio can be easily defeated. They are also believed to have concluded that if it is possible to buy Maada Bio with huge cash, they would endeavor to do so, using Dr Prince Harding who is a friend of president Koroma, just to ensure that Kandeh who has huge credibility does not emerge as the SLPP flagbearer. Its good to see Maada Bio behaving like a statesman. Let us hope that he is not hiding his raw military instincts and psyche, otherwise salone will be in much bigger trouble than we faced in the early 1990s. Few military leaders have managed and succeeded in shedding their authoritarian and dictatorial tendencies. And this is what frightens me about Brigadier Maada Bio. Will he turn on his own people if elected president? I guess one way of proving his good intent and real pedigree is for him to begin to show his respect for civil liberty and democratic freedoms, by first of all ordering his thugs to stand down and stop intimidating his opponents. Secondly he must show respect for the rule of law and the SLPP constitution. He must also show that he respects plurality and diversity not only in the party because across the nation, because right now his mendeism is showing quite strongly. Maada Bio visiting State House demonstrates how our democratic system is growing. We don’t need to avoid ourselves for the sake of partisan politics. At the end of the day we are living in one country, we shouldn’t allow politics to stigmatise us, because this will create psychological violence within our lives. Political trauma is not a good syndrome for our politicians. So let us try by all possible means to have good relationships among our selves that will kill hate speech and bad behaviour. Some people are seeing this move as a social influence that will occur in the future, which I strongly believe will never happen because of their different political parties and policies. Anyone who thinks Sierra Leoneans should continue to live on handouts should wait and see their verdict in 2017 or 2018. The hour of the Rights of the people is at hand, as the old shall give way to the new. This is good NEWS!